For the Japanese rock band, see Abingdon Boys School. The precise date of Abingdon's foundation is unclear. Some believe the school to have been founded prior to the 12th century by the Benedictine monks of Abingdon Abbey, with a legal document of 1100 listing Richard the Pedagogue as the first headmaster. From its early years, the school used a room in St Nicolas' Church, which itself was built between 1121 and 1184. The school now takes its anniversary from the earliest surviving reference to the school – 1256 – a charter of Abingdon Abbey recording an endowment by Abbot John de Blosneville for the support of thirteen poor scholars. In the past though, the school considered itself as having been founded by John Roysse in 1563. This led to the unusual circumstance whereby the school celebrated its 400th anniversary in 1963 (at which HRH Princess Margaret was guest of honour), and then its 750th in 2006 (at which HRH Princess Anne was guest of honour). The focus on 1256 facilitated extensive anniversarial fundraising in 2006. By the time of de Blosneville's endowment in 1256, the school had moved to a couple of rooms in Stert Street with a house for boarders at 3 Stert Street under the charge of a Dionysia Mundy. With John Roysse's re-endowment of 1563, the school moved to a site south of the Abbey gateway. Roysse was a prosperous mercer in the City of London, and through this association the school has received substantial benefactions from the Worshipful Company of Mercers. The name Roysse's School was used until the 1960s and many older Abingdon residents still use the term. After the dissolution of Abingdon Abbey in 1538, the school passed through a difficult phase: the sixteenth century endowments by Old Abingdonians attempted to overcome the loss of monastic support. Thomas Tesdale, who had been a pupil in 1563, made provision for an Usher to teach six poor scholars from the Borough of Abingdon and offered support for thirteen Abingdon students to study at Oxford. This benefaction eventually developed into Pembroke College in 1624 by the re-foundation of Broadgates Hall. The six poor scholars, known as Bennett Boys, or colloquially as the Gown Boys due to their dress, were financed by another Old Abingdonian, William Bennett. Between 1609 and 1870 the school maintained a dual management: the Headmaster, appointed by the Mayor and Corporation, and the Tesdale Usher and Bennett Scholars appointed by the Master and Governors of Christ's Hospital, Abingdon. Despite being penalised during and after the English Civil War for its royalist and Anglican tendencies the school survived and achieved somewhat of a revival under headmaster Robert Jennings (1657–1683). 1671 saw the expulsion of ten boys after they refused to attend Anglican services at St Helen's church. The original school building on the current site, which houses the chapel, lower school, and School House, along with several other dayboy houses and classrooms. The bell tower is still in use, and the fields in the foreground are used for playing rugby union and cricket. The school experienced a period of success during the 18th century under headmaster Thomas Woods (1716–1753), known as "Flogging Tom". The school became popular among the local aristocracy and many OAs went on to successful careers in various areas. In 1743 The Old Abingdonian Club was inaugurated, it is consequently one of the oldest such organisations in the country. At the turn of the century the school went into decline under the leadership of the "incompetent" headmaster Dr. John Lempriere. As a consequence Pembroke College, Oxford, used the University Reform Act of 1854 as an excuse to cut its links with the school. The current school site in the Victorian quarter of Abingdon, adjacent to Albert Park, was designed by Edwin Dolby and was developed from 1870. Its architecture was described in The Builder that year as externally "of a simple character, the local material of red brick and tile being the chief material employed, relieved by bands of Bath stone". Extensions to the 1870 buildings were added in 1880. In 1901, a chapel and gymnasium were built. The adjacent Waste Court property was acquired in 1928. The Science School came in 1952. In 1963, to mark the Quartercentenary of the school's re-foundation, the big schoolroom was re-ordered as the Grundy Library (opened by HRH Princess Margaret), together with erection of further buildings east of the Science Wing, the whole becoming known as Big School. In 1980, the Amey Theatre and Arts' Centre was opened and the Sports Centre opened in 1984. Mercers Court was opened in 1994 by the Chancellor of Oxford University and Visitor of Pembroke College, Baron Jenkins of Hillhead. In 1998, it merged with Josca's, a preparatory school four miles to the west at Frilford which since 2007 has been known as Abingdon Preparatory School, with both schools becoming part of the Abingdon Foundation. There are strong connections with the nearby School of St Helen and St Katharine in Abingdon. In 2003, the new Arts Department was opened (adjacent to the Amey Theatre). On 4 October 2008, the newly completed Sports Centre was opened by MP Kate Hoey. This multimillion-pound project took 5 years to complete and has increased the floorspace of the school by 40% Plans for the complex were formally launched by HRH Princess Anne in 2006. In September 2010 Felicity Lusk, formerly headmistress of Oxford High School for Girls, a GDST school, replaced Mark Turner as Head of Abingdon. She became the first female Head of a boys' boarding public school. A recent addition to the School's facilities is a new Yang Science Centre by Hopkins Architects. Opened in October 2015 housing 21 laboratories, study areas and prep rooms. The previous science building was refurbished in 2016 with new rooms for history, geography and classics and new sports facilities were installed at Tilsley Park. In 2016, Lusk was replaced by Michael Windsor. In 2018, a new development called Beech Court was completed and opened in November. It houses a new library, Sixth Form Centre, and art facilities. The Good Schools Guide called it "an impressive school which does what it sets out to do well", also noting that it was "likely to increase in popularity because of its location and increasingly sparkly achievements", while The Times described it as "an elite boys' boarding school". The school currently has c.970 pupils aged 11–18, of whom 134 are boarders. The school is split into 10 houses, one of which is for boys in years 7 & 8 (Lower School, c.120 boys), three of which are for boarders and dayboys in year 9 and above, and six for day boys in year 9 and above. With the exception of Lower School, School House, Austin House  and Crescent House, the houses are named after their current Housemasters and are thus prone to change. Boys in Lower School have a pastoral tutor within the house for two years before being redistributed to the 9 "senior" houses when they move into year 9 and are joined by c.100 boys from other schools. In years 9 to 13 (3rd year to Upper 6th) they have the same housemaster, but usually three different pastoral tutors, specialising in 3rd year, the GCSE years and then the Sixth Form years, Though this is subject to the particular house and change, with many boy having fewer tutors throughout their time at the school. Abingdon is notable in the region for its extracurricular activities. Dubbed the "Other Half" (of the syllabus), there are over 130 activities currently available. The Other Half takes place at various times during the week, during some lunch times and especially after lessons end (so between 4 and 5.15 pm on most week days but with an extended period from 2.30 pm on Wednesdays). Saturdays are key times for boys to participate in school activities, most notably in sports fixtures but also in specific events in regard to music, art, science and many others. Abingdon has a strong sporting tradition, especially in rowing, rugby union and cricket. In recent years the school has reached the later stages of the Daily Mail U18 rugby cup whilst also gaining places in the last four of the HMC national 20/20 cricket competition. Sport is compulsory at Abingdon School and each student must do at least two sessions per week. The boat club has a long history with documentary evidence indicating rowing was a school activity in 1830. Roysse's School Rowing Club (1840) became the Abingdon School Boat Club. The Debating Society is the school's oldest non-sporting society, founded in 1904. It debates a variety of motions in its weekly meetings, from the humorous to the serious, with many being political in nature. Abingdon takes part in a variety of national debating, public speaking and model United Nations competitions, often achieving notable success, as in 2009 when a group of Abingdon boys were national champions of the 2009 European Youth Parliament competition. The society also holds black-tie dinner debates with girls' schools, including the School of St Helen and St Katharine, Wycombe Abbey and Westonbirt School. The school produces ten publications including the 130 year-old Abingdonian. The School's Edmund and Roysse Societies hold talks for boys several times a term, inviting eminent speakers to lecture on a wide variety of subjects. Abingdon has a Combined Cadet Force, which consists of RAF and Army sections. Although membership of the CCF is voluntary at Abingdon, it remains a large and popular activity. The CCF has achieved several successes with cadets in the contingent's Royal Air Force section winning the 2002 Ground Training Competition (South East) at RAF Uxbridge, Middlesex. The shooting team went on to become the top team at the National final that same year. The Abingdon Film Unit (AFU) exists as part of the "Other Half" and has created nearly 100 films since its creation in 2004. Notable successes include the screening of two films at the BFI Southbank. These were Gravel and Stones, an emotional insight into the lives of various Cambodian landmine victims, and One Foot on the Ground, a documentary following the life of an aspiring Moldovan, basketball player. Festival screenings for various other films include Raindance, the London International Documentary Festival, the Bradford Animation Festival, and the British Film Festival in Dinard, France. Awards include Best Documentary, Best Fiction and Best Animation at the Future Film Festival in London and the National Young Filmmaker's Award at the Leeds Student Film Festival. To date, the most decorated AFU production has been Blindside: awards include the BFI Future Film Award, Student Filmmaking Awards (Finalist), Grigsby Film Award, Depth of Field International Film Festival Award, Future of Cinema Film Festival Award and Nashville Film Festival Award. The film's success led to considerable attention from local media. Abingdon is academically a strong school: the students regularly achieve excellent results and a significant number progress to the most prestigious universities, including around 20 to Cambridge and Oxford. At A Level, the 2017 A*-A percentage averaged 63.3% At GCSE, the A* percentage in 2017 was 60.2% and the A*-A percentage 86.3%. At GCSE, most of the courses followed are at the iGCSE level (international GCSE) and all examinations are taken in year 11 (5th year), i.e. there is no "early" take of qualifications even for top sets. The top two Maths sets at GCSE follow the iGCSE and Additional Maths qualifications. In sixth form, A Levels are followed to AS and then A2 level, but following the reforms put in place under Michael Gove, the school has decided that, from September 2015, it will follow a linear system (i.e. courses will be completed over two years) and will not be offering the new stand-alone AS qualification. As a consequence of this freedom, some departments will be offering the Cambridge pre-U course instead of the traditional A Level. The school holds a number of events, dinners and balls throughout the year. The "Foundation Dinner", to honour the school's founders and benefactors, is held once a year towards the end of Lent term. It is normally attended by Abingdon Town Councillors, supporters of the school, governors, famous OAs, school prefects and upper sixth scholars. The school also take part in an annual lacrosse match on St. Katherine's Day, between Abingdon 1st rugby team, and St. Helen's and St. Katherine's School. A notable school event is the "Griffen Ball" held at the end of the school year. It is often attended by members of the upper sixth who are leaving the school as well as other students and many parents and teachers. The ball itself is often preceded earlier in the day by the school's annual prize-giving ceremony. Former Second Master and Housemaster Donald Willis published several books of autobiography. His first, Eggshells and Tea Leaves (Robert Dugdale, 1981) recounted the story of his early life in Oxford in the 1920s and 30s before going on to recall his wartime experiences as an officer in the Royal Artillery serving in many theatres of the war, including the Italian campaign, in which he was mentioned in dispatches. This, together with his other books, Early Days in Oxford, outlining in more detail life in Oxford from 1916 to 1940, A Song on a Bugle Blown, describing life at Abingdon School after the Second World War, and an historical novel, Storm Clouds Over Ireland, were all written following a series of severe strokes which forced his early retirement from Abingdon School. Waste Court House and Lacies Court Abingdon School Misc. Finds 1997–1998 and Waste Court House Abingdon School Final Report (Evans, R.T.J and Excell, P.P. ), concerning archaeological investigations at the school. ^ "Abbey Arms – Abingdon – Leading Oxfordshire independent school". abingdon.org.uk. ^ "RBH Biography: Thomas Tesdale (1547–1610)". berkshirehistory.com. ^ "School Building News". The Builder. 28: 471. 1870. ^ Ellery, Ben (26 November 2009). "The first woman head". Oxford Times. ^ "Yang Science Centre Opens". Abingdon School. ^ "Felicity Lusk 23 February 2015 – Abingdon – Leading Oxfordshire independent school". abingdon.org.uk. ^ The House System – pastoral care. Abingdon School. Retrieved 19 September 2013. ^ "Waste Court to be renamed Austin House – Abingdon – Leading Oxfordshire independent school". abingdon.org.uk. ^ "Big Sculpt – Abingdon – Leading Oxfordshire independent school". abingdon.org.uk. ^ Abingdon School: Sport. abingdon.org.uk. Retrieved 19 September 2013. ^ Abingdon School: Boat Club. abingdon.org.uk. Retrieved 19 September 2013. ^ "Get Writing". Abingdon School. ^ "John and Aim's film set for the big screen". Oxfordshire Guardian. Retrieved 5 December 2016. ^ "A Level Statistics 2017 – Abingdon – Leading Oxfordshire independent school". abingdon.org.uk. ^ "GCSE Statistics 2017 – Abingdon – Leading Oxfordshire independent school". abingdon.org.uk. ^ "The Curriculum – Abingdon – Leading Oxfordshire independent school". abingdon.org.uk. ^ "Sixth Form Curriculum". abingdon.org.uk. ^ "dead link". Abingdon School. Archived from the original on 29 July 2011. Retrieved 17 September 2018. 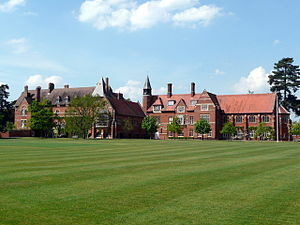 Wikimedia Commons has media related to Abingdon School.